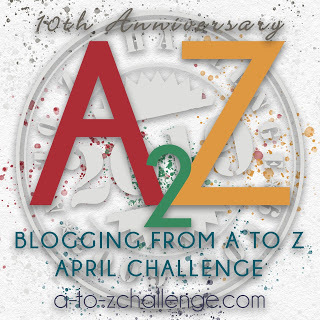 In this A to Z journey, till now I have brought to you stories of sportspersons from Tennis, Chess, Gymnastics, Cricket and Hockey. Today I will move over to track and field and bring you the story of a very important sportsperson of a bygone era. This athlete is none other than the star of the track and field, in the thirties, Jesse Owens. Owens was the youngest of ten children born to Henry Cleveland Owens and Mary Emma Fitzgerald in Oakville, Alabama on September 12, 1913. When Jesse was nine his family shifted to Cleveland, Ohio for better opportunities. When his new teacher wanted to know his name for entering it in the roll book, he replied that his name was "J.C", but the teacher mistook his strong southern accent and thought he meant Jesse. The name stuck and for the rest of his life, he was known as Jesse Owens. As a young man, Jesse had to sustain his family by taking several jobs like delivering Groceries, loading freight cars and so on. His father and brothers worked in a steel mill. Jesse discovered his love for running during his schools days and he was encouraged by his school coach Charles Riley to take up athletics as a career. It was in Fairmont High school that Jesse met his wife who was with him till his death in 1980. Her name was Ruth Solomon and when they met she was 13 and he was 15. They remained with each other through high school and their first child, a girl was born in 1932. They married in 1935 and Ruth later gave birth to two more daughters. 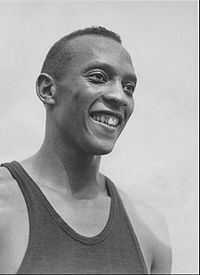 Owens captured people's attention for the first time when he equalled the world record of 10,3 seconds in a 100 meter dash and jumped 24 feet and 9 1/2 inches in the National High School Championship in 1933. He attended Ohio State University once his father was suitably employed and the family did not have to worry about sustaining itself. It was in the 1935 Big Ten meet at Ferry Field in Ann Arbor, Michigan that Jesse Owens achieved world fame and became immortal. In this event, in the span of 45 minutes, he set three world records and tied a fourth. He set the world record in long jump with a jump of 26 ft and 8 1/4 inches which lasted for 25 years. He completed the 220-yard sprint in 20.3 seconds. He also completed the 220-yard low hurdles in 22.6 seconds thus becoming the first to breach the 23-second mark. He also equalled the world record for the 100-yard dash completing it in 9.4 seconds. The 45 minute period during which Owens set these records has been described by many as the 'the greatest 45 minutes ever in sport'. Next came the 1936 Berlin Olympics held in front of the Aryan supremacist, Adolf Hitler. At that time the world was in the throes of the aggression that would eventually lead to the outbreak of the second world war. Owens achieved international fame in the Berlin 1936 games by winning 4 Gold medals. He won the medals in the 100 meters, 200 meters, long jump and the 4 X 100 meters relay. It was reported by many that Adolf Hitler did not congratulate Owens. But Owens himself has clarified the haze surrounding this. There is also another heartwarming story about how a German long jumper Luz Long helped Owens win the Gold in the long jump event in the Berlin Olympics. Owens had fouled his first two jumps. He had only one more attempt and he needed to clear 7.15 meters in it if he were to qualify for the finals to be held later. Owens was sitting looking extremely dejected. At this point, Luz Long walked up to him and advised him to jump from a point several inches behind the takeoff board. The fact was that Luz Long who had been watching Owens realized that he would be able to clear the required 7.15 meters by taking off from a point ahead of the takeoff board as Owens routinely jumped distances greater than 7.15. This would enable Owens not only to clear the required 7.15 meters but also to avoid fouls. And finally, Owens was able to qualify by jumping from a point that was 4 inches behind the take-off mark. In the finals, Owens won the Gold and Luz Long won the silver and they posed for photographs together. Owens returned from the 1936 Olympics to the US as a celebrity but at that time there was a lot of racism in the US. He did not get too many endorsements. He later became an instructor for the New York Mets. He then started a dry cleaning business and then worked as a gas station agent. But finally, he had to file for bankruptcy. He was also convicted for tax evasion. As part of his rehabilitation, the US government appointed him a goodwill ambassador. He travelled the world and spoke to several companies. One of them is the Ford Motor Company. He retired and at that point he owned racehorses. Owens was a chain smoker since he was 32 years old. He was afflicted with an aggressive form of lung cancer. He died of the disease at the age of 66 in Tucson, Arizona on March 31, 1980. His family was with him when he died. He was buried in the Oakwoods cemetery in Chicago. The dormitory in which Owens stayed during the Berlin Olympics has been converted into a living museum showcasing his accomplishments. Among these is a letter from a fan, written during the Berlin Olympics urging him not to shake hands with Hitler. It is said that this letter was found by the Gestapo after the games. The Jesse Owens Award has been instituted in the US and is considered the highest award for a US track and field athlete. ESPN ranked him the sixth greatest North American athlete of the track field for the 20th century and the highest ranked in his sport. I hoped you enjoyed reading about this marvellous athlete. I will be back with a new sports personality tomorrow. Enjoyed this a lot, Jai. I admire Jesse Owens so much! Most of the sport people end their life in addiction & bankruptcy. After the Olympics, after discovering new champion we forget the old medal winners. It is sad to see how Jesse (J.C) had to work in gas stations when he entered the US. Enjoyed reading this post. Yes, several tennis players, boxers and other sports persons become wayward and lose their money and end up bankrupt. It is indeed something very sad. Good to know about players, their life.. I'm enjoying your posts sir. He was a very famous person in his time. Thanks for visiting. Through your posts we are exploring the unexplored. Thank you. Loved reading this post and a great applause for Jesse who made it through all the odds. And man he did et some great records. Yes, he was an undisputed champion in his days. Thanks for visiting. So many interesting facts about Jesse Owens. Like the rest of the world even I thought his name WAS Jesse! Loved the waving out to Hitler part! Swag! True and deep friendships when you are in the same field are rare, and it's always good to know when 2 people have them, like Jesse and Luz did. One thing I realise is that sport people , and even actors, of that era could never handle money well or invest wisely. Yes, most sports persons, actors of those era became wayward and lost all their money. And yes the tale of the friendship between Luz Long and Jesse Owens is the stuff of legends. An inspiring character!!! Very interesting facts about Jesse Owens. Makes me think why so many sportpersons end up bankrupt. Yes, Most of them become wayward and end up bankrupt. The teacher mistook J.C. to Jesse. but what was his real name? Luz Long's sportsman-spirit has to be admired and applauded. In the age of competition , a friendship was forged. It stands for James Cleveland Owens. And yes, Luz Long was indeed a great sportsman. Thanks for visiting. Am so glad you have come up with this theme. Such great things to know and learn from real life incidents. Great efforts Jai. Keep them coming. Yet another great story Jai. I have been introduced to many sports personalities I have not known and basically heard only in passing. I am happy my posts are introducing new people to you. Thanks for visiting. Amazing post on an amazing sportsperson. Just a small correction if i may highlight. I guess where you have mentioned his 100m timing...its should be 10.3 instead of 9.4. Correct me if I am wrong. Thanks for the correction Manas, yes it is 10.3 seconds. I have corrected it now. Thanks for visiting. Oh! I always thought that was his name. Huhh! Oh, I used to play a bot of cricket during school days, but I love to watch many sports. Thanks for visiting. Yes, Jose. These people were indeed inspiration to subsequent generations. And happy that it reminded you of your nineth grade lesson on Jesse Owens. Loved reading this story and yes most of the sports stars and movie stars ended up their lives in bankruptcy and addictions as they didnt know how to manage their limelight. Yes, after their playing days their discipline gets wayward and they fall into bad days. Thanks for visiting Suhasini. All medals aside, I loved the reading about the friendship between Luz Long and Owens. It takes sportsmanship of another kind to help a competitor and acknowledge it too. Truly sad to see how he had to resort to all kinds of things to sustain after his prime. Guess the scene has changed. Players take their financials way too seriously now. You know later Luz Long died in the war in 1942. Long was just a victim of circumstances with absolutely no racial hatred. A sportsman who was truly generous to his opponents. It must have taken a lot of courage to do what he did in front of Hitler. A great friendship. And yes Jesse Owens ran into a lot of trouble after retirement.